Evaluating activated carbon performance is important because all carbons are not the same and they do need to be replaced when exhausted, to maintain specified performance. Performance should be validated before installation and periodically to assure it is still working. Save a sample put into working adsorbers. Standard ASTM carbon industry test methods and advanced methods should be used by vendor or manufacturer and purchaser independently. Carbon users should contract independent testing services. In order to evaluate performance of activated carbons it is necessary to have a modern understanding of its physical structure at macro and molecular scales. All activated carbons are not the same; you need to choose wisely for your applications. Each feedstock used in its manufacture provides unique physical, chemical composition and performance applications opportunities.1 Presently, the major feedstocks to manufacture activated carbons are different ranks of coal, coconut shells and wood. Some work on bamboo shows as a good feedstock.2 Following is a classical representation of molecular-scale structure for carbon and three major feedstocks represented by modern carbon models at molecular scale. We will not cover all of the historical models for activated carbons here but will provide the most popular classical and modern models.3 Our understanding of structure and how activated carbons work has occurred over the last 50+ years. Figure 1, classical root structure for activated carbons, was initially put in the literature by Calgon Carbon Corporation (CCC) over five decades ago. We have drawn a universal ‘do not use’ symbol through the root model, as there was little scientific basis for it and this early model for physical adsorption on activated carbon structure was recognized to be inadequate because it indicates molecular sieving only. It is based on molecular sizing and molecules go in and out of carbon granules using exactly the same pathway. This representation still shows up in present-day publications. Adsorbates, however, have equal access to all adsorption sites. Larger molecules or stronger adsorbates can competitively displace smaller molecules previously adsorbed on carbon surfaces. Physical adsorption of organics on carbon depends on organic water solubility, concentration, refractive index and molecular size relative to other contaminants in the feedwater to carbon. A dimer will adsorb two times better than its monomer. The higher refractive index, the better for adsorbability. Most important for organic adsorbability is water solubility: least soluble adsorbs best. Modern models are based on ample scientific basis. They emphasize graphitic platelets of varying sizes; wood has the smallest-sized platelets and coconut the largest, with coal intermediate. Wood has the largest spacing between platelets and coconut the smallest. These major carbons are represented in Figures 2-4. Adsorbing molecules have multiple ports of granule entry and exit and can be displaced by a stronger binding adsorbate. This phenomena is called rollover. 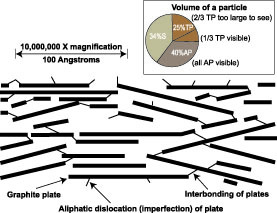 The modern model classifies adsorption spaces or pore sizes into functional transport or physical adsorption pores instead of the classical micro-, meso- and macro-pore sizes. 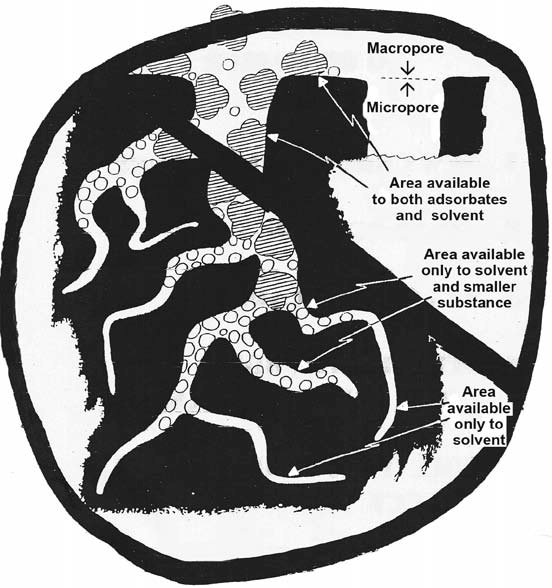 Transport pores are too large to adsorb; they transport molecules to adsorption sites. Transport-sized pores are determined by mercury intrusion using variable hydrostatic pressure. Pore sizes correlate with specific pressures. Adsorption site numbers and kinds are best determined by GAED testing, which provides the adsorption energy (AE) distribution and the volume of adsorption space for each AE. You need to think in terms of these relatively new activated carbon models. Sometimes you will need to go beyond ASTM standard methods to get what you need. Performance-based methods are accepted in decision making and legal cases, as long as it is based on good science. There are practical differences between standard- and performance-based methods. Following a standard method has less burden for a laboratory compared to developing a performance-based, improved method. Method development is time consuming and expensive, but a necessary part of advancing the state-of-the-art of water conditioning and purification. ASTM iodine and butane tests challenge test samples with near-saturated adsorbate concentrations. Yet, most real-world user carbon applications face well below saturated adsorbate concentrations. Adsorbate loading capacity on carbon is directly related to water or air concentration passing through carbon. 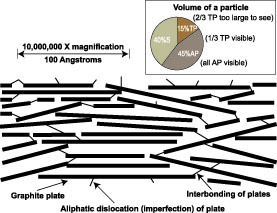 Smaller particles adsorb faster and provide sharper mass transfer zones. GAED provides adsorbate loading capacity over eight decades of adsorbate concentration. Thus, it provides carbon users realistic, expected loading performance in real-world applications and loading of specific organics of interest at concentration and temperature of interest. Since reactivation cost for carbon is about half of unused, reactivation is a common practice. Typically, used carbons from drinking water applications are relatively easy to regenerate. Essentially the same thermal process equipment to manufacture carbon is used for reactivation of used carbons. Reactivators have small laboratory units to quickly determine if the used carbon can be reactivated, before the full load of used material is accepted. Before a reactivation plant accepts a used carbon, it must know what adsorbates are on carbon. Sometimes there is a chemical spill that contaminates the carbon filter water supply and occupies adsorption space in the drinking water carbon beds. This results in shortened service time and early carbon change-out. If the adsorbed contaminant is not strongly bound, it can be competitively desorbed. The task of defining what is on used carbon requires advanced analytical test methods. Adsorbates need to be quantitatively extracted off of carbon surfaces and followed by validated instrumental standard test methods. Adsorbate extraction and instrumental analysis is briefly covered in the next two sections. It is possible to quantitatively identify contaminants or impregnants (organic, inorganic, microbiological) on carbons. Identifying contaminants means revealing species on carbon samples and quantitative analysis means ability to reveal how much of the chemical species is present on tested carbon. There are safe allowable maximum contaminant levels (MCL) for many organics in drinking water supplies although some compounds detected in water supplies do not have a determined MCL. Gas chromatography/mass spectrometry (GC/MS) combined instruments are used to determine volatile6 and semi-volatile and pesticide7 organics on carbon. Standard known materials are run to compare against contaminants isolated off of carbon. GC separates components in a complex solvent mixture into many different retention-time peaks. Coincidence of retention time and peak shape with standard provides a tentative identification. 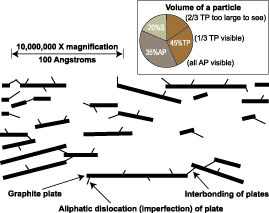 Similarity of MS molecular fragmentation and pattern of pieces of standard and carbon contaminant provides proof for confirmed identification. You need both GC and MS data agreement for standard and contaminants to legally defend a structural identification and quantitative value. These GC/MS advanced methods for organics are rigorous and time consuming but required to be legally defensible. In order to avoid any misconceptions that GC/MS is fail-proof, I want to give some examples to emphasize the importance of professional data interpretation and data validation. You need a professional experienced analyst with three to five years of experience. Isomers, such as dichlorobenzenes, provide different GC retention times, but the mass spectral pattern is essentially the same for all three isomers. Often, contaminants coming off of GC column have co-eluting compound(s). Since MS standards are pure compounds, the multiple-component sample peak is difficult to compare, but it can be done. A practical example is the ongoing West Virginia chemical spill that occurred this January, where a community suffered from an organic contaminant spoiling drinking water for consumers using Elk River water. The Elk River Kanawha valley water shed has numerous large chemical firms. Hydroxy-methyl-cyclohexane (HMCH) escaped from storage tanks into the river. HMCH is easy to detect, because it has odor and taste at low ppb concentrations. HMCH does not have an MCL in drinking water and its safety is not known. The hydroxyl group increases5 methyl-cyclohexane (MCH) water solubility and thus, is less adsorbable than MCH. The additional hydroxyl functional group also provides a reactive group with possible dehydration or esterification on carbon surfaces. Therefore GC/MS analysis of HMCH contaminant needs to include these possible derivatives on carbon. Since HMCH is a commercial mixture, its total composition needs to be known. Intellectual property issues often block revealing all components of complex industrial mixtures, such as fracking formulations. Since HMCH’s active ingredient may be only a small percent of contaminating mixture, importance of other components may be paramount. Samples of commercial HMCH needs to be run on GC/MS to define all components in the mixture. Since the carbon has a finite volume of adsorption spaces, it is important to know the volume percent of components in commercial HMCH. Knowing the components enables prediction of how well they are carbon adsorbable and competitively desorbed.1 HMCH below analytical detection levels will accumulate on carbon. It is possible to be desorbed later and be detectable in the finished water. Municipal water plants and domestic home water units with carbon facing this HMCH contaminant have a lingering problem. HMCH previously adsorbed can leach off of the carbon because it can be competitively desorbed. Desorbers only need a higher refractive index than HMCH. Domestic home water filter users only need to replace their low-cost carbon filters to eliminate the leaching, taste and odor and possible health effects; municipal plants need to replace the carbon beds with fresh material. Used carbon with HMCH and derivatives can be recycled by furnace reactivation. Municipal drinking water plants have different configurations of their carbon filters. They have different amounts of carbon between the raw water supply and drinking water users and they have different schedules for replacing exhausted carbons. Some have filters which can be back-washed. Carbon filters can be connected together in a series to increase the amount of carbon between raw water and finished polished water, which decreases risk but is more expensive. This configuration provides opportunity for maximum carbon usage (gallons treated per pound of carbon) before it is replaced. Plants with carbon beds not connected together have higher risks of desorbed contaminants leaking out to the distribution system. The safest strategy for Charleston’s HMCH exposed filters is replacement. The Occupational Safety and Health Administration (OSHA) has a standard GC method for industrial hygiene solvent vapor analysis in the work space, based on carbon adsorption and carbon disulfide desorption. The OSHA method uses a GC/flame ionization detector (GC/FID), because carbon disulfide does not yield a GC peak by GC/FID. This solvent, however, is not sufficient for GC/MS, because it elutes for the first two minutes and interferes with early eluting contaminants. Two obvious problems with carbon disulfide solvent as a carbon desorber for GC/MS are that this solvent has impurities detected by GC/MS and the first few minutes of the GC chromatogram has solvent coming out and masking the presence of early eluting volatile contaminants. Benzyl alcohol as desorber and solvent alleviates these carbon disulfide problems because it is relatively pure batch to batch; it elutes late from the GC column and does not interfere with volatile early eluting organic contaminants. Metal analysis on carbons can be facilitated by acid extraction followed by standard methods ICP analysis. Microbes residing on the outer surfaces of carbon granules can be dissociated with mild sonification into water for standard methods testing. Accurate and precise quality information about contaminants on carbon is highly dependent of ability to get high recovery of bound adsorbates for analysis. Do not underestimate the importance of this difficult task. These instrumental methods, GC/MS and ICP, are used to analyze raw water to determine if treatment is needed and to monitor filtered-water unit effluents to determine media needing change-out. Most carbon users periodically (every three to six months) take carbon out of working filters and test the carbon for remaining performance. When an activated carbon has a significant amount of volatile matter, it should be tested for DOT self-heating and drop-ignition tests.8 A self-heating test involves putting a cube of the used carbon in a 160°C oven to determine if the temperature abnormally rises. Passing these tests provides confidence that tested material will not cause a fire during transportation and storage or if it has an unacceptable risk and requires special handling. Activated carbon has over 2,500 applications. For some drinking waters, it is the only way to fix problems. It has more surface area than any other known material and surface area is responsible for its ability to remove organic and inorganic substances from water. A teaspoon of AC has more surface area than a football field. The activated carbon industry now can manufacture a wide variety of carbon to solve problems. This provides difficulties for carbon users to select the best carbon for their application. Carbon users now need to be educated to deal with all of the different carbons and available test methods to select and monitor carbon performance. Education is key to success in using carbon to solve problems. The authors recommend that every household have a POU device containing activated carbon, which provides a final filter for drinking water. It removes chlorine taste and odor extremely well via a chemical reaction. Hypochlorous acid is used at water plants as a final process before distribution to provide disinfection. Carbon is a reducing agent similar to copper and it reacts chemically with hypochlorous acid to reduce it to tasteless chloride ion. It will remove chlorine taste and odor longer than removing organics, thus do not wait for chlorine breakthrough to change your POU filter. Filters need to be changed regularly; they are cost effective, but not designed to last forever. POU has a relatively small amount of carbon between incoming and outgoing water and while it is not designed to take the place of municipal water plants, it is well-suited for an emergency, like the hydroxyl-methylcylohexane contamination in Charleston, WV. Water plants with relatively small amounts of granular carbon between incoming and outgoing water run the risk of contaminant breakthrough during abnormal influent concentrations. Those plants, running thin granular activated carbon (GAC) beds need to have powdered carbon (PAC) readily available. Batch use of PAC is used at plants to deal with summer-time plant-growth taste and odor and it can be used in front of carbon beds during an emergency, such as occurred with the HMCH leak, to protect GAC beds. PACS Activated Carbon Short Course. Activated Carbon Adsorption: Principles, Practices, and Opportunities. Nowicki, H. Development of Bamboo into Premium Activated Carbons. 34th International Activated Carbon Conference, Pittsburgh PA. September 24, 2014. Greenbank, M. Plenary lecture at 3rd International Activated Carbon Conference. Advanced Test Methods and Structural Models for Activated Carbons. Pittsburgh PA. 1997. ASTM International standards of activated carbon test methods. D5742 Test method for Determination of Butane Activity of Activated Carbon; D5228 Test Method for Determination of Butane Working Capacity of AC; D3467 Test method for Carbon Tetrachloride Activity of Activated Carbon; D2854 Test method for Apparent Density of Activated Carbon; D2867 Test methods for Moisture in Activated Carbons; D4607 Test method for Iodine Number; D5832 Test method for Volatile Matter and D5919 Practice for Determination of Adsorptive Capacity of Activated Carbon by a Micro-Isotherm Technique for Adsorbates at ppb Concentrations. Antal, M. Plenary lecture at 31st International Activated Carbon Conference. Is Elevated Pressure Required to Achieve a High Fixed-Carbon Yield of Charcoal from Biomass? Honolulu, HI. 2013. Nowicki, H. and Henn, C. Calgon Carbon Standard Method, Isolation and Identification of Volatile Organic Chemicals on Carbon. 1979. Nowicki, H. Solvent Recovery of Semi-volatile Organics on Used Carbon Adsorbates. SBIR EPA Grant and Pennsylvania Ben Franklin Grant. 1986. DOT Self-heating and Ignition test method. Henry Nowicki, PhD/MBA is PACS Activated Carbon Services Inc. President and Senior Scientist. He has been awarded nine government SBIR contracts for R&D on new activated carbon products. Nowicki provides the introductory course for PACS Activated Carbon School titled “Activated Carbon Adsorption: Principles, Practices, and Opportunities.” He has been an expert witness for environmental, safety and activated carbon cases. Nowicki is Technical Chairperson for the bi-annual International Activated Carbon Conference. He may be reached at (724) 457-6576 or email Henry@pacslabs.com. Wayne Schuliger, PE is a PACS technical consultant and teaches “Design, Operation, and Troubleshooting AC Adsorber Systems.” George Nowicki, BS directs the PACS day-to-day laboratory services. Barbara Sherman is a laboratory technician and directs PACS short courses and conference registrations. She can be reached at Barb@pacslabs.com or phone (724) 457-6576. PACS Activated Carbon Services Inc. provides laboratory routine and advanced testing, consulting and training courses and sponsors the bi-annual International Activated Carbon Conference and Activated Carbon School. The next carbon conference is September 24-25. Some information is at www.pacslabs.com or call (724) 457-6576.